The Air Canada Foundation helps connect sick children to the medical care they need, alleviate child poverty and make the wishes of ill children come true by supporting pediatric hospitals, providing assistance to charitable organizations and fundraising. 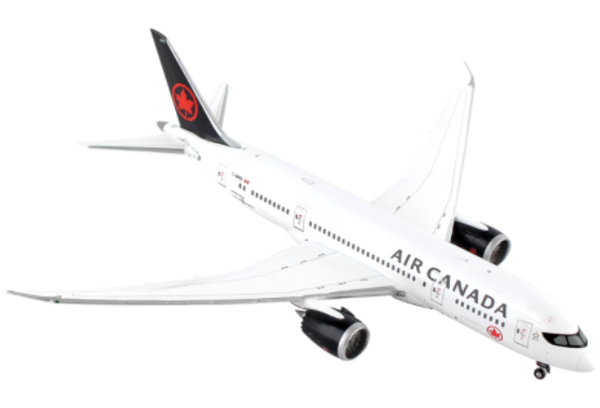 Purchase this officially licensed Air Canada Dreamliner model knowing that part of the proceeds benefits children in Canada. 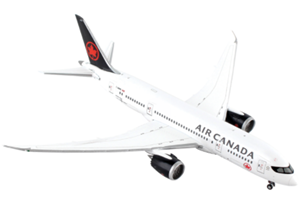 This officially licensed Air Canada Boeing 787-8 Dreamliner die-cast metal airplane model comes in 1/500 scale. It includes landing gear and a high level of detail. Model is approximately 4 ½ inches long with 4 ¾ inch wingspan. The Boeing 787 is revolutionary for its efficiency, comfort and quietness. Truly the future of aviation.